In cooperation with the Office of the High Commissioner for Human Rights (OHCHR), the Palestinian Centre for Human Rights (PCHR), today organized a conference titled “Death Penalty in OPT”. This conference was organized on the occasion of the World Day Against the Death Penalty commemorated on 10 October every year. 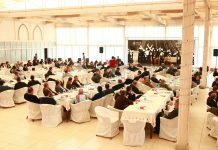 Many academics, journalists, civil society organizations’ representatives and other interested figures participated in the conference. PCHR Deputy Director, Jaber Wishah, opened the activities of the conference by delivering his speech. Mr. Jaber explained that the subject of the conference is one of the most important issues that affect Palestinians’ life. He added that the application of the death penalty and its negative consequences are still ongoing, and accordingly called upon all the parties, mainly academics; community figures and political activists, to seriously confront this issue. In OHCHR opening speech, Saul Takahashi, OHCHR Deputy Director, explained that the death penalty is an important matter that deserves discussion. He continued by saying that the application of the death penalty poses a serious question regarding the level of civilization enjoyed by States applying the death penalty. He finished by expressing his hope that the conference would have effective outcomes. The conference was organized in two sessions to discuss two main subjects: the death penalty in international law and in the Islamic Shari’a, and the death penalty in the occupied Palestinian Territories (OPT). Hamdi Shaqoura, the Director of PCHR’s Democratic Development Unit, headed the first session that included three presentations. Mr. Shaqoura pointed out the particularity of the Palestinian case. He said that the death penalty in the OPT is not only applied by the Palestinian National Authority; it is also applied by the Israeli occupation forces in the form of extra-judicial killing, which is a form of execution, but without judicial process. The first presentation in the first session was delivered by Dr. Tareq Mkheimar, Director of OHCHR’s Human Rights Department. He talked about the death penalty from a human rights perspective, reviewing the historical development of the death penalty. He explained that the international movement that calls for the abolition of this penalty has begun to grow up in the wake of World War II, and in line with the Universal Declaration of Human Rights and other international instruments which hold that the death penalty violates human rights. Mkheimar mentioned a number of provisions in human rights instruments aiming at decreasing the application of this penalty. The second presentation was delivered by Dr. Suleiman ‘Odeh, an Islamic Preacher and a lecturer at al-Azhar University of Gaza. The presentation was titled “death penalty from the perspective of the Islamic Shari’a”. Dr. ‘Odeh began by explaining that Islam blesses human life, and considers the protection of life to be one of its holiest goals. He explained that the death penalty in Islam is limited to one application, which is the killing of an innocent. Dr. ‘Odeh explained that Islam is an advanced level of civilization and that the application of the death penalty under the Islamic Shari’a, is based on civilized bases. He added that other regimes apply the death penalty without referring to any regulations or standards. He also explained that in Islamic Shari’a, the application of the death penalty can be sought only by victims, while in other systems, this penalty is a right that can not be waived. In the third presentation, which is the last presentation in the first session, Saul Takahashi, OHCHR Deputy Director, talked about assassinations or extra-judicial execution under international law. He explained that the existence of a conflict between two parties or more does not justify that the two parties uses all available means to kill. Takahashi particularly talked about the principles of distinction and proportionality, two fundamental principles of International Humanitarian Law. He said that under the principle of distinction, unarmed civilians must not be targeted and distinction must be established between them and combatants. In regard to the proportionality principle, he explained that proportionality relates to the employed force and the danger to be averted or confronted. The second session, which also included three presentations, was headed by Dr. Tareq Mkheimar, Director of OHCHR’s Human Rights Department. The first presentation was given by Yuni Kim, OHCHR Director’s Charge d’affaires in Gaza. She talked about accountability and immunity under International Humanitarian Law. She explained that the right to life is an undisputed right that all human beings must enjoy. She said it is important to unify efforts in order to hold accountable all those who violate this right. Kim said that States have obligations to ensure accountability mechanisms through the establishment of jurisdiction systems and conducting serious investigations, especially in the light of the absence of Israeli effective redress mechanisms to bring justice to the victims of the Israeli violations. Salah Abu Hatab, a social activist, gave the second presentation which was titled “Death Penalty under the Rule of the Palestinain National Authority”. He explained that PNA applies this penalty according to three local laws which are: the Penal Code no. 74 for the year 1936 which is applied in Gaza and which was enacted by the British Mandate to serve its interests, the Jordanian Penal Code no. 16 for the year 19460 which is applied in the West Bank and which was enacted by the Jordanian administration to serve its interests, and the Revolutionary Penal Code enacted by the Palestinian Liberation Organization which is not a constitutional law and which was not submitted to PLC for ratification. Abu Hatab explained that the majority of death penalty sentences in the OPT were issued under the Revolutionary Penal Code. The third and last presentation was delivered by Nafez al-Khaldi, a researcher at PCHR’s Democratic Development Unit, titled “Extra-Judicial Killing, an Israeli Official Policy”. He said that assassinations are a clear example of the crimes of willful killing committed against Palestinian civilians. Israeli forces are guided by an official and explicit Israeli policy, represented in the Israeli Supreme Court that ensures judicial immunity to perpetrators. Between the two sessions of the conference, there were many discussions made by participants who posed a number of questions. The conferees replied to the posed questions.